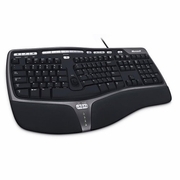 Microsoft USB Natural Ergonomic Keyboard 4000. This newest addition to the #1 best selling line of ergonomic keyboards makes day-to-day tasks easier with a more natural wrist alignment. Get a closer lookzoom in quickly and accurately with the intuitive Zoom feature. Zoom in quickly and accurately with the intuitive Zoom feature. With the touch of a finger you can zoom in to edit small details, like red eye in digital photographs, then zoom out to view the entire imagewithout taking your hand off the keyboard. The Zoom feature makes it a breeze to read small print in documents and spreadsheets, and tiny text in e-mail and Web pages. It's as intuitive as adjusting the lighting in a room by using a dimmer. Just slide a lever on the keyboard to zoom in and zoom out. Perform common tasks, like opening documents and replying to e-mail, with the touch of a button. You spend a lot of time in front of your computer. In fact, the only thing you touch more often than your mouse and keyboard is your pillow. Microsoft offers some of the most comfortable hardware available. Commonly used symbols such as equal sign, left and right parentheses and "Backspace" are in quick reach, just above the number pad.